On March 4, 1861 – exactly 150 years ago today – the United States Government Printing Office opened for business. On such an auspicious occasion, Government Book Talk examines a unique Federal Government document. Ordered by the President on the tightest possible deadline for a purpose of international importance, only one copy was created by GPO. It is also, as far as I know, the only GPO product ever reproduced in its entirety on a postage stamp. Here’s the story of the Malta Citation. From 1940 to 1943, the British Crown Colony of Malta endured prolonged and brutal air attacks launched by Nazi Germany and Fascist Italy. The Axis was determined to bomb or starve the people of Malta into submission to deprive Great Britain of a vital naval base and, in so doing, dominate the Mediterranean. Despite saturation bombing and near starvation conditions caused by submarine attacks on British supply convoys, the Maltese people carried on with exemplary courage until the Allied invasions of North Africa and Sicily ended this threat. To honor their resistance to Nazi aggression, King George VI awarded the George Cross to Malta and its people in recognition of an entire nation’s collective valor. 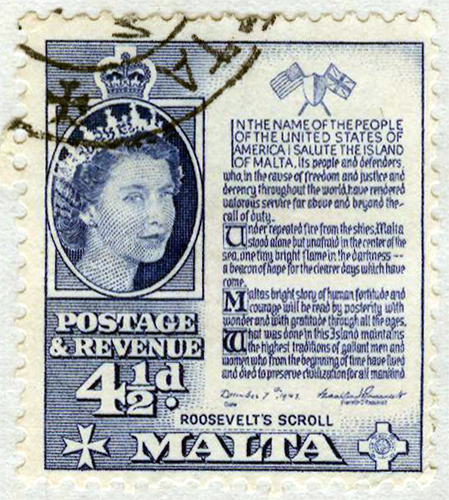 In November 1943, President Franklin Delano Roosevelt decided that America also should salute the people of Malta. He decided to visit the islands after the “Big Three” conference with Churchill and Stalin in Teheran and present the Maltese people with a citation that expressed the sentiments that Malta’s defense had inspired in the American people. The text was composed at the White House, but it fell to GPO to transform that text into an appropriate form. The order for the Malta Citation was forwarded to GPO from the White House on November 15. Delivery was required not later than 3 p.m. on November 24 to meet the deadline for transport halfway around the world. 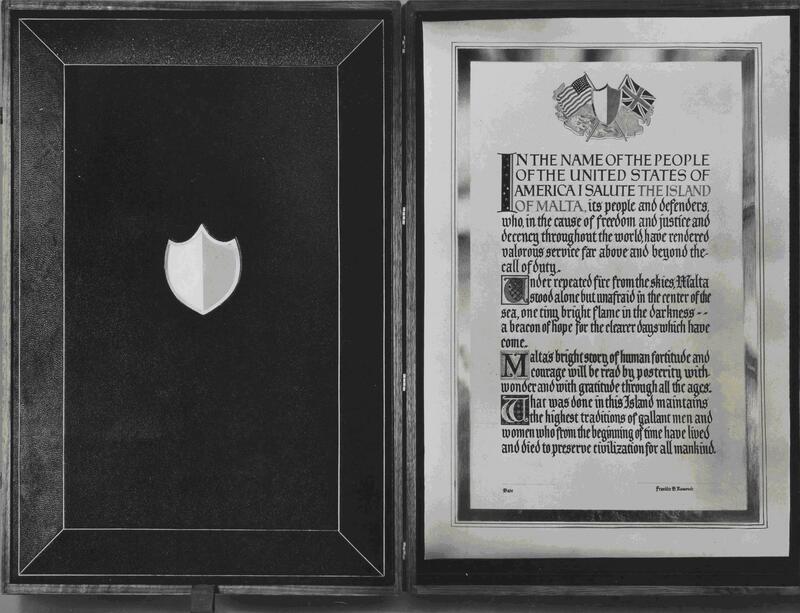 The President suggested that the citation should be about 16 by 24 inches with lettering resembling that of medieval illuminated manuscripts. The details of color and design were left up to GPO. A complicating factor was secrecy. For reasons of security, the President’s visit to Malta could not be allowed to leak out. This combined need for speed, secrecy, and artistic excellence made the Malta Citation one of GPO’s most exacting and unusual wartime assignments. The Malta project was assigned to GPO’s Division of Typography and Design. Its Director, Frank H. Mortimer, was given complete responsibility for the design and execution of the Citation. Because of the need for secrecy, and because only one copy was required, Mortimer decided to do the job by hand rather than experiment with type faces. He chose to work with genuine sheepskin parchment, feeling that its qualities of endurance and its capacity to retain freshness of lettering in both black and colored inks made it the most logical choice. He used steel and crow quill pens, drawing letters in the gothic style he had selected. Two sketches were prepared and submitted to the President, who chose the simpler version. Once the design was approved, Mortimer set to work. He used red and black inks for the 1-page text, with initials illuminated in blue, red, and gold. Pure gold leaf was used in the surrounding border, along with two fine lines of blue and red on the outside. An ornamental design consisting of the shield of Malta with the flags of the United States and Great Britain, all superimposed upon an aerial contour map of the main island, was placed above the text. And the postage stamp? In 1956, Malta issued a stamp (left) that reproduced the Citation’s text, documenting its importance to the Maltese and serving as a reminder of the huge variety and high quality of work that GPO has produced for the last century and a half. Happy birthday, GPO! My agency, the U.S. Government Printing Office (GPO), usually is more concerned with getting information from other Federal agencies digitized, printed, posted, and disseminated than in publishing our own books – that’s been our job in the Federal Government for almost 150 years. When we do publish something of our own, such as our Style Manual, about which I blogged awhile back, it’s worthy of note. That’s my lead-in to 100 GPO Years, 1861-1961, published to mark GPO’s centennial. I’m sure it didn’t make a particular splash in the world of books back then, but it’s a rare and beloved commodity for those of us who work here, or used to. After a brief history of pre-GPO public printing, replete with scandals and corruption (and that’s why Congress decided to establish GPO), the book chronicles GPO’s activities year by year. The growth of GPO paralleled that of the Federal Government, spurred on by the Civil War, two world wars, the Cold War, the New Deal, the Great Society, and all of the other historical developments that gave rise to America’s present status as a superpower. For all of these momentous chapters in our history, GPO was there, printing the Emancipation proclamation, the declarations of war for both world wars, the UN Charter, and innumerable other documents of our democracy. Remarkably, though, we’re still at the same location as we were in 1861, at the corner of North Capitol and H Streets NW in Washington, DC. Instead of one small building, there are four large ones, as well as facilities nationwide. On June 23, 2010 – the 150th anniversary of the congressional resolution that established GPO – a reprint of 100 GPO Years was a centerpiece of the kickoff of GPO’s sesquicentennial celebration. It’s a facsimile reprint, but with a new Foreword, an excellent index, and a colophon that describes the typefaces of both printings. On March 4, 2011, 150 years to the day after the inauguration of both GPO and Abraham Lincoln (it was the first day GPO was open for business), GPO will publish a new history. Until then, you can learn a lot about us by reading the straightforward narrative and sampling our unique historic photograph collection in 100 GPO Years. You can read the reprint on our anniversary Web site or purchase a copy here. Soon it will be available in Federal depository libraries nationwide. If you can’t wait, you can find the original printing in some libraries. My favorite new features of the 2008 edition: A list of information technology acronyms and initialisms; a chapter on capitalization with totally updated examples of proper names (a lot of research went into this, believe me! ); and a clean, contemporary new design and typeface, thanks to GPO Creative Services. 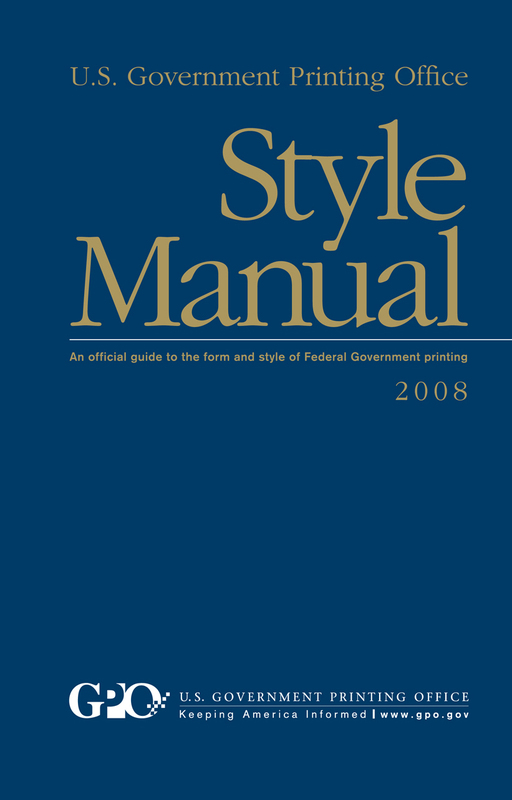 Despite my obvious bias in favor of the Style Manual, many other Government books and periodicals are worthy of inclusion in the library reference pantheon – you can find a few of them here.